March 9th sale results are in. Sorry it took so long. I been swamped with fish and game meetings, banquets and other ITA activities. 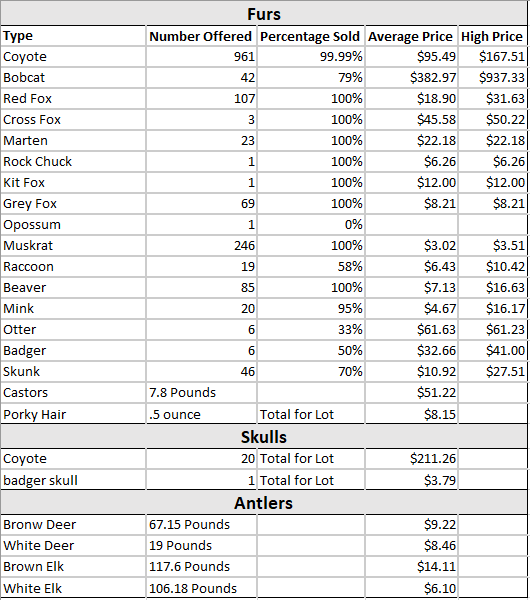 A lot of rough coyotes brought averages down farther than I expected. Still have 75 no sale/no bid coyotes at my place that need to find homes. Flipping through the ones in my fur shed, them 99% of them are rubbed badly. 75% of them should NOT have been skinned. Trappers need to realize that not every Idaho coyote is a heavy "Alberta Pale" coyote. 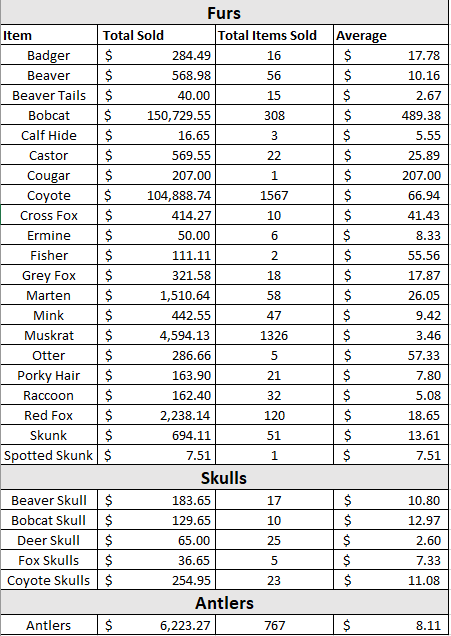 Overall I was very happy with coyote, cat and rat prices. Top coyote was $188.26 sold to Thunder Mountain and top cat was $1,665.43 sold to Western Montana. Top coyote buyers were Western Montana, American Hide and Fur, Zander Fur and Thunder Mtn. Top cat buyers were Western Montana, Rocky Mtn Fur, American Hide and Fur and then Great Basin (Pappas). Thank you very much to all buyers and sellers.